Sunday night, my dad, sister and I decided spur-of-the-moment to go see Star Trek: Into Darkness. I have never been a Star Trek fan (I did watch several of the old series episodes just for Spock), and did not care at all for the 2009 movie Star Trek. But I had a very strong motivation for wanting to see this new installment in the series, and it can be summed up in two words: Benedict Cumberbatch. So far, I’ve only mentioned him in my post “Wrist Rest, Explanations and Little Red Hen”, but despite my near silence on the subject, I am a huge Benedict Cumberbatch fan. When he is not reading fairy tales, Cumberbatch spends his time being a phenomenal actor. As I only have seen him in very dignified, proper-British-gentleman rolls, I was thrilled at the idea of watching him play a villain, even if I had to endure Star Trek to see it. I began the movie by bracing myself for disappointment. By the end of it, I was on the edge of my seat, delighting in every minute. 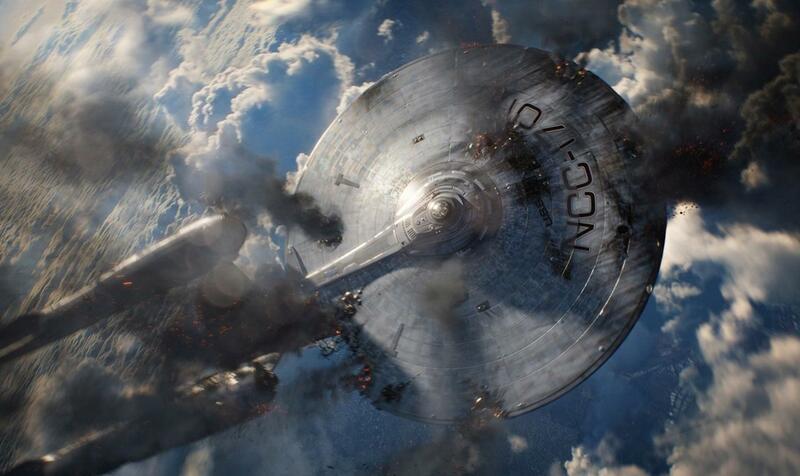 Star Trek: Into Darkness begins where Stark Trek (2009) left off. Captain James T. Kirk (Chris Pine), his first officer and friend, Spock (Zachary Quinto), and his crew are exploring space on the starship, Enterprise. Kirk revels in the thrill and power of being Captain of his own ship, and doesn’t like playing by Starfleet’s rules. One of his escapades on a strange planet goes very wrong and nearly gets him and some of his crew killed. When he returns to Starfleet base on Earth, Kirk’s irresponsibility and selfishness continue. 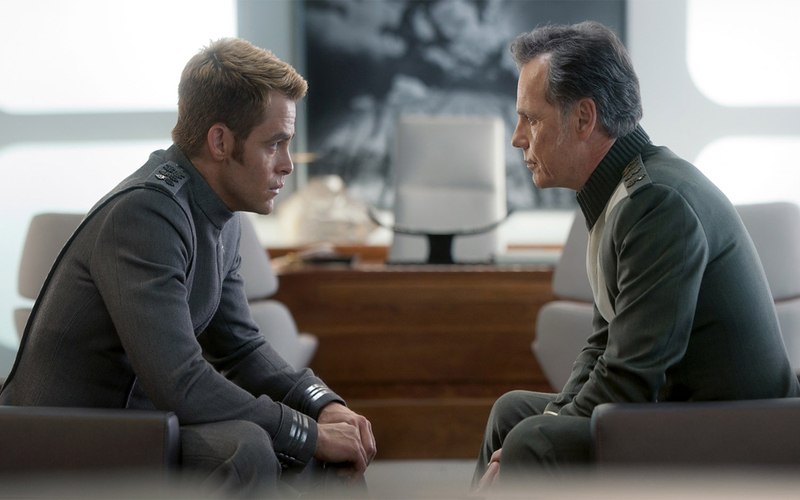 Captain Pike (Bruce Greenwood), Kirk’s friend, mentor, and previous captain of the Enterprise, is furious with him. Pike confronts Kirk for his lack of maturity, humility, and responsibility. Kirk is horrified to discover that – due to his own lack of character – he may be forced to give up everything. 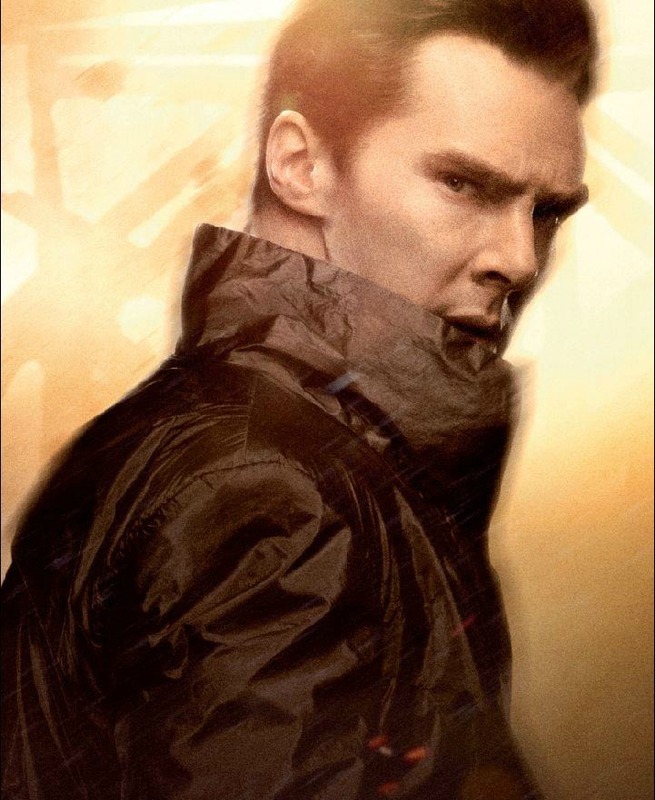 When terrorist attacks aimed at Starfleet begin popping up around Earth, Kirk, anxious for a second chance to prove himself, starts a manhunt for the mind behind the attacks: John Harrison (Benedict Cumberbatch). Although Star Trek: Into Darkness is without a doubt primarily an action movie, the characters were excellently developed. In Star Trek, I couldn’t care less about Kirk and his crew; I didn’t sympathize with anyone or even like them at all. In Into Darkness, I was almost immediately attached to everyone, even though I was prejudiced against them from my experience with the first film. Kirk’s and Spock’s interactions were so much fun to watch. I found their friendship to be very similar to Sherlock Holmes and Watson’s. Like Holmes, Spock is all logic and no emotions. Kirk is constantly rolling his eyes at his friend’s stoicism and trying to get Spock to show even the slightest tinge of feeling. The complete contrast in personalities was very well acted and made me laugh several times. I will go ahead and say that I have never liked Kirk. I mean, he was kind of a lovable nerd in the old series, but he never impressed me. No matter what he said to the contrary, I always got the feeling that he cared more about himself than his crew, and more about the state of his clothes and hair than the state of the ship. Not exactly my idea of a hero. 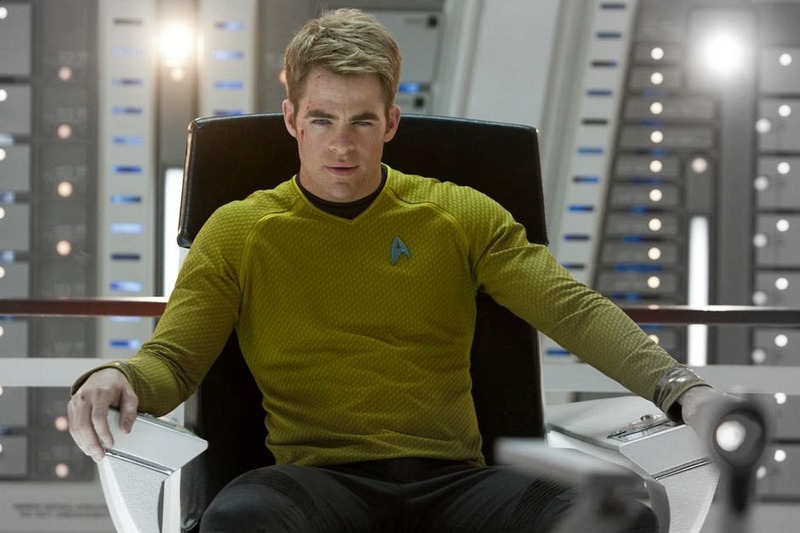 Kirk in Star Trek: Into Darkness begins as very much the man I just described: sort of likable, but arrogant and shallow. Captain Pike says to Kirk in Into Darkness, “Son, I saw greatness in you. But now I see there’s not an ounce of humility. You think you can’t make mistakes. But one day you’re going to realize you’re wrong about that and you’re going to get yourself and everyone under you killed.” And to my utter surprise and delight, Captain James T. Kirk took those words to heart and he changed. I think that Jim Kirk’s new found honor, humility and courage is what ultimately made me enjoy Star Trek: Into Darkness so much. No matter how cool the effects are, no matter how good the acting, no matter how compelling the story line, if the characters in a movie are weak and selfish, I am guaranteed to dislike the film. Unlike the first movie – in which Kirk remained egoistic and petty throughout – Star Trek: Into Darkness shows Jim gradually becoming more noble, mature and responsible. Before I knew it, the spoiled child had turned into a hero prepared to protect his crew, no matter the cost. James T. Kirk became a man worthy of being called Captain. As far as secondary characters go, Captain Pike was one of my favorites. He was an all-around good man – upstanding, honorable and wise. I absolutely loved the way he acted sort of like a father to Kirk: encouraging and scolding, forgiving and loving. I only wish Pike had more scenes in the film. Uhura was a very refreshing character. Hollywood portrays most female military characters as tough, harsh, and feministic. Uhura was a very strong, smart character with a good head on her shoulders, but at the same time she was caring, gentle, and lovely. An awesome combination, if you ask me! While no one can possibly come close to Deforest Kelly’s performance as Bones in the old series, the new actor who played the crotchety old doctor did well. Sulu, Chekhov and Scotty were fantastic. I actually loved the new actors even more than the original ones. Scotty, especially, was such a fun character – he had me laughing more times than I can count! And now – drumroll please! 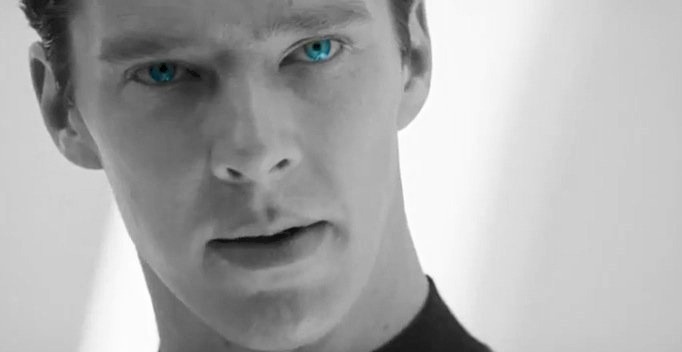 – John Harrison, the baddie himself. I have to admit that, as confident as I am in Cumberbatch’s acting abilities, I was a bit nervous that he wouldn’t be able to play a convincing villain. (Though acting alongside Andrew Scott, Moriarty in the BBC miniseries Sherlock, Cumberbatch must have picked up at least some tips on playing a spine-chilling villain.) He’s so dignified, gentlemanly, and stately in real life and in most of his acting roles that I was afraid he couldn’t pull off a bad guy. I shouldn’t have worried; he was absolutely brilliant. Like one of my family members said afterwards, Harrison was so awesome that sometimes it was hard not to cheer for him instead of for the good guys. His character was a bewildering and compelling combination of wickedness, dignity, level-headedness, savagery, and genius. One moment I hated him for all the murders he committed in his acts of terror. The very next moment all I could feel was pity, as he explained in tears why he committed them in the first place. On top of all that, Harrison was just plain cool. His hand-to-hand fight scenes were amazing, his weapons, his secret hideout, and his black cloaks all combined to make one extremely tough villain. Also, his lines were really neat. One of my favorites was in his conversation with Kirk. Kirk asked Harrison why so-and-so (trying to avoid spoilers here) had been using Harrison to help develop weapons and new technology. Harrison stared straight at Kirk. Another recommendation I’d make to anyone planning on seeing Into Darkness is to spend the extra couple of bucks and watch it in 3D. I absolutely love the extra “wow” element that 3D brings to any show, but it fit especially well with this movie. So many of the space shots were gorgeous in 3D, and all of the action scenes really benefited from it as well. And while certain movies seem a bit fuzzy or out of focus in RealD, the 3D for Into Darkness was perfectly clear and easy to watch. My sister’s eyes bother her a lot when watching most RealD movies, and even she didn’t have a problem with the 3D on this show. 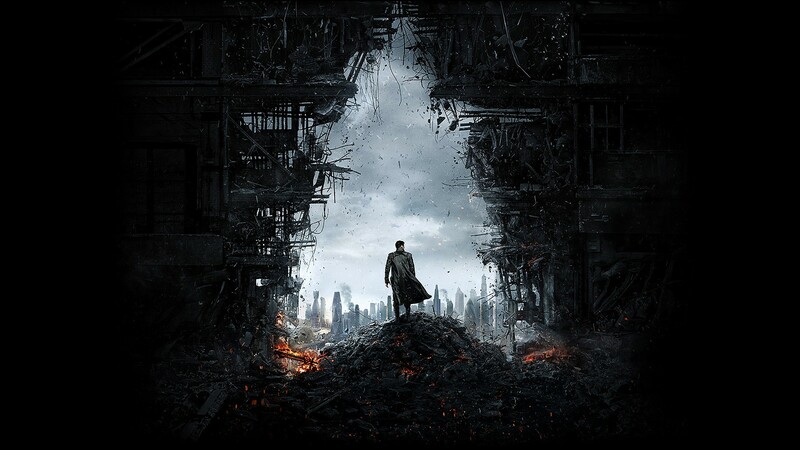 RealD is a must if you plan on watching Star Trek: Into Darkness in the theater. For someone who was completely prejudiced against all things Star Trek, I was shocked at how much I loved Star Trek: Into Darkness. It was the perfect combination of fun effects and a good story, lovable characters and amazing action sequences. I often hear action movies condemned as being shallow and pointless, a bunch of explosions with a nearly invisible thread of a storyline. 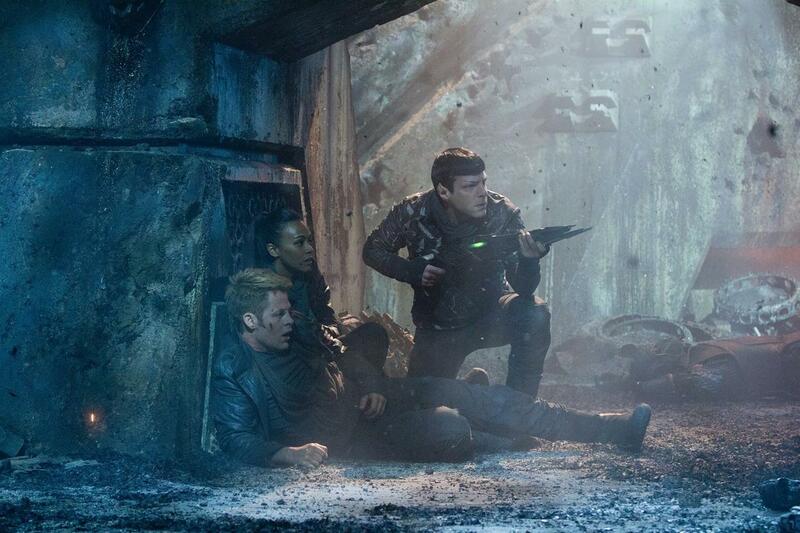 Star Trek: Into Darkness proves that, happily, that is not always the case. Without a doubt it belongs to the action-adventure genre, but it is action-adventure at its best. Whether you’re a long-time Trekkie, or have never seen a Star Trek episode in your life, I will tell you this. 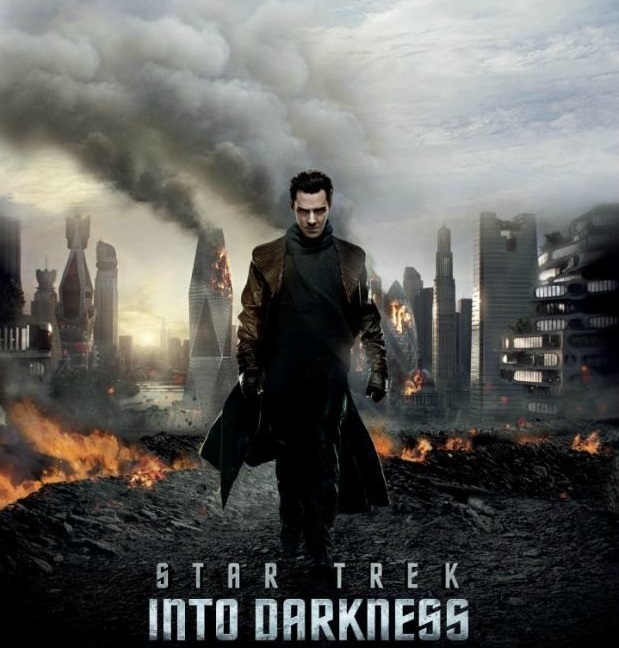 Compared to every other Star Trek-related show I have ever seen, Star Trek: Into Darkness was better. At everything. ← I’m Going On An Adventure! That was a very enjoyable review, Victoria. I am not a movie watcher (more of a bookworm) but I would be willing to give this one a shot! 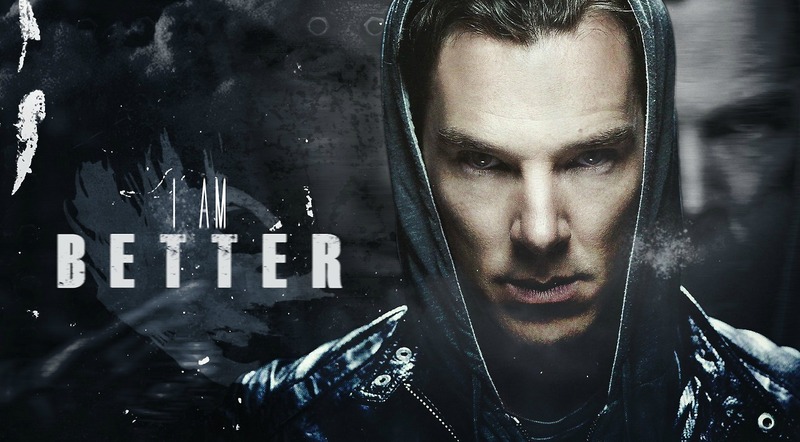 I admit – I’m tempted to go see it, just for the Cumberbatch’s sake, but we’ll probably end up waiting for the DVD. (We see about two movies a year – any Middle-Earth installment, and some superhero movie.) It does look like a really fun movie. As an aside….oh my gosh. Karl Urban – a.k.a. Eomer. I’m still not used to seeing him without the long blond hair. Still it boldly went where no stunningly clever has gone before…. Thanks for commenting! I’m so glad you liked my post. I read your review as well and really enjoyed it! Oh, yes, I thought that J.J. Abrams did a wonderful job on this movie. He stuck pretty close to the original series, but added lots of fresh twists and turns. 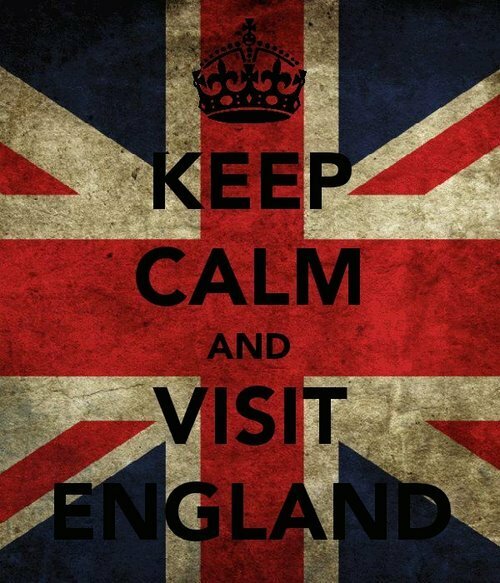 Thanks again for reading (and hopefully enjoying) my blog! Good review. Go see this movie, it’s great for Star Trek fans and it’s great for just movie fans in general. Thank you! I’m really glad that you liked my review. 🙂 Thank you so much for taking the time to comment!